« Bach, C.P.E (1714-1788) Les Symphonies Wq.182. Christopher Hogwood. 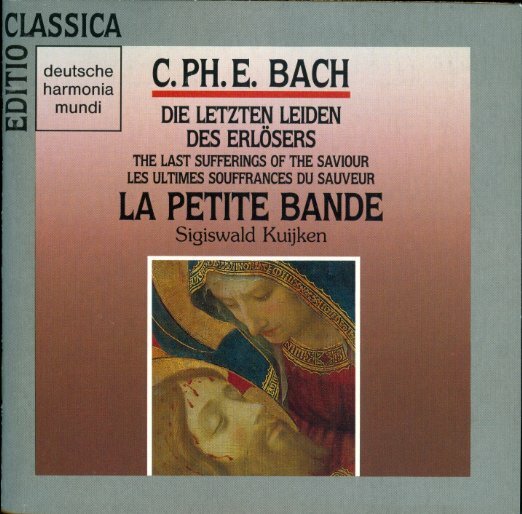 Bach, C.P.E (1714-1788) Les Ultimes Souffrances du Christ. Sigiswald Kuijken. Barbara Schlick, G.de Reyghere, C.Patriasz. Christophe Prégardien, Max van Egmond. Collegium Vocale Gent. La Petite Bande. Enregistré à Doopsgezinde Gemeende, Pays-Bas en 1986. Harmonia Mundi. 1990. 77042-2. 2cds. 119m.46s. This entry was posted on 2 avril 2012 at 2109 57 and is filed under Bach CPE with tags Les Sommets. You can follow any responses to this entry through the RSS 2.0 feed. You can leave a response, or trackback from your own site.